Unitron’s latest generation of hearing aid models feature North, a powerful new technology designed to help patients hear better in a wide range of conversational situations. Not all conversations are created equal and each comes with its own set of background noise. To overcome this, Moxi hearing aids on the North platform come fully integrated with three cutting edge technologies – SoundNav, Sound Conductor and SpeechZone. By blending these together, Unitron North hearing aids can automatically identify and classify seven distinct sound environments, including four specifically targeted for conversation; quiet, small groups, crowds, and noise. The overall result is that users are provided with better speech understanding and natural sound quality. 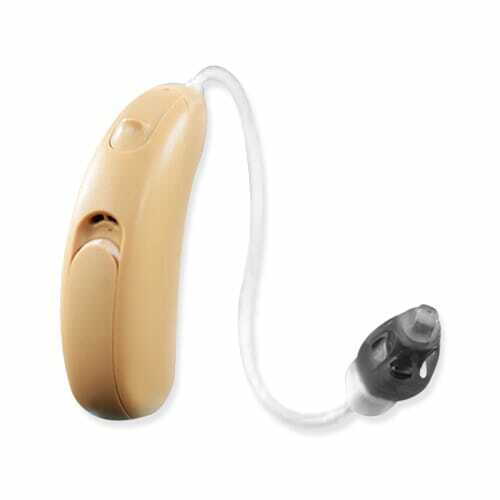 Moxi Dura is the largest of Unitron’s open ear RIC hearing aids and is designed to stylishly accommodate a larger, size 13 battery for those that need longer battery life or more power. Dura is also the only model capable of handling the Super Power Plus receiver for more severe hearing losses. For more technical and lifestyle information about hearing aids check out our General Information page.